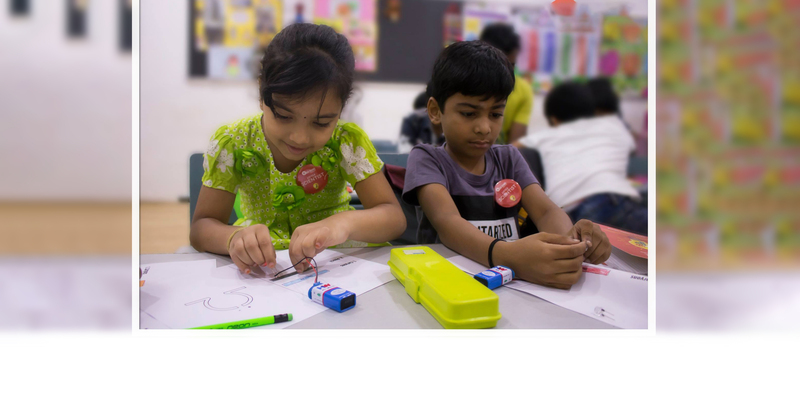 Aeronautical Engineering Workshop: This is a certified workshop for kids which teaches children about the propulsion of helicopters, airplanes and rockets. These topics are usually assumed as complicated but we have designed it in such a way that it breaks down the topic to its fundamentals in a fun and engaging way and increases the curiosity of children by portraying it like a magic show. This week aeronautical class was about propulsion. A seemingly interesting topic for children or for anyone as a matter of fact, but was difficult to pull off because of over-excitement of students. Although it’s a usual sight for our hosts since all our science topics are taught in activity based and shown as a magic trick rather than the traditional teaching methodology. Everything is designed naturally to tweak children’s curiosity which makes the excitement a natural consequence. An elaborate preparation was done to make this weekend class happen. 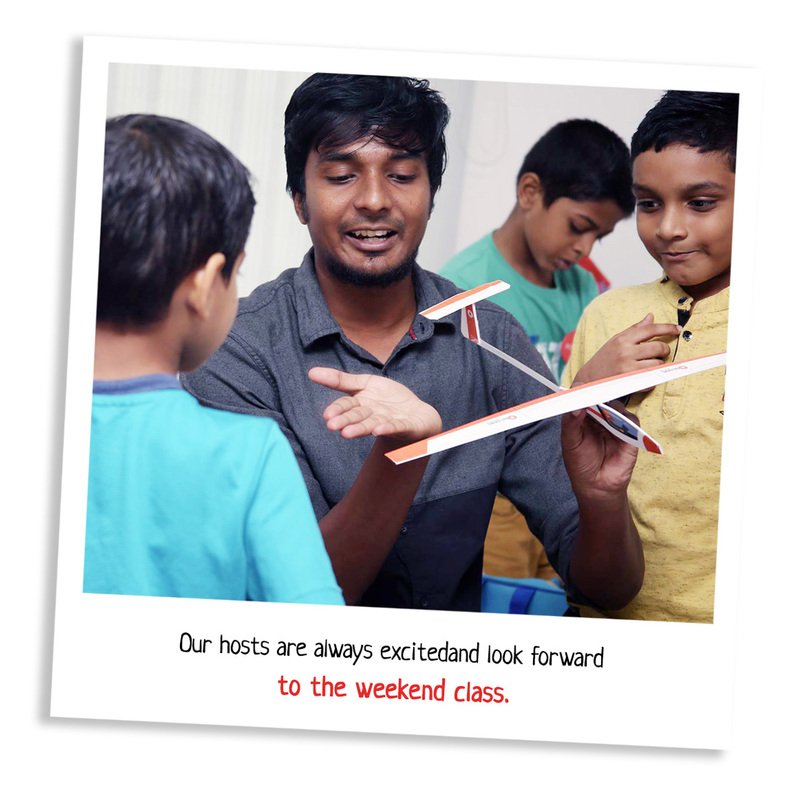 Our hosts are always excited and look forward to the weekend class. They discuss what happens in class, which student did what and what topics they will convey throughout the week. This is a usual process in the workplace. If a stranger comes and sees how the discussions happen between the hosts about the weekend workshops, they would think it’s a plan done for a detailed picnic. You can imagine the excitement among the staffs. The work and the preparation were mainly done for thermocol airfoil (to know about the shape of wings), propulsion, give-away kits and the animated video of a jet fan to learn about propulsion.Particularly propulsion we showed made children excited. It can give a great understanding of how a helicopter works. It is very simple to build but it was never taught to our children. Children were literally out of their seats to get a touch of the propeller. Our hosts struggled to control this time since every single kid was out of their seats. We did presentations to explain various aspects of propulsion in the beginning. 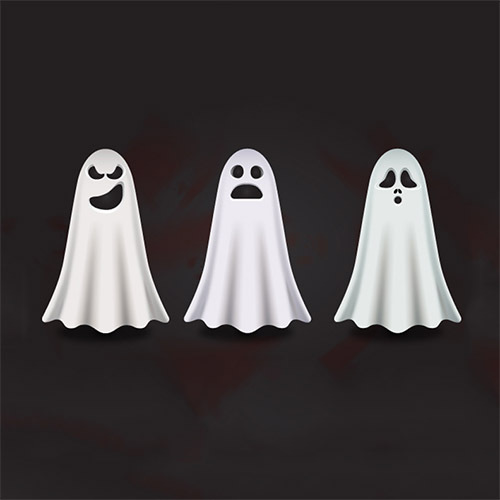 The presentation was almost like an animation which kept children silent. They went extra-ordinarily vibrant when the science activity had started. The hosts separated children into teams and assigned activity-based tasks. Most of them completed their tasks ahead of time. There were times where the hosts couldn’t keep up to the speed of the children. We gave the task of building a mini-bridge with wooden sticks. This is to understand the concept of constructing bridges and children were shouting us to give those wooden sticks to get their hands on.Then came the Liquid Nitrogen demonstration to make them understand rocket propulsion. We made plastic bottles to shoot 30 – 40 meters high. It literally shoots like a rocket and we could hear voice raising when the bottle leaves the ground. This was the best part of the day. 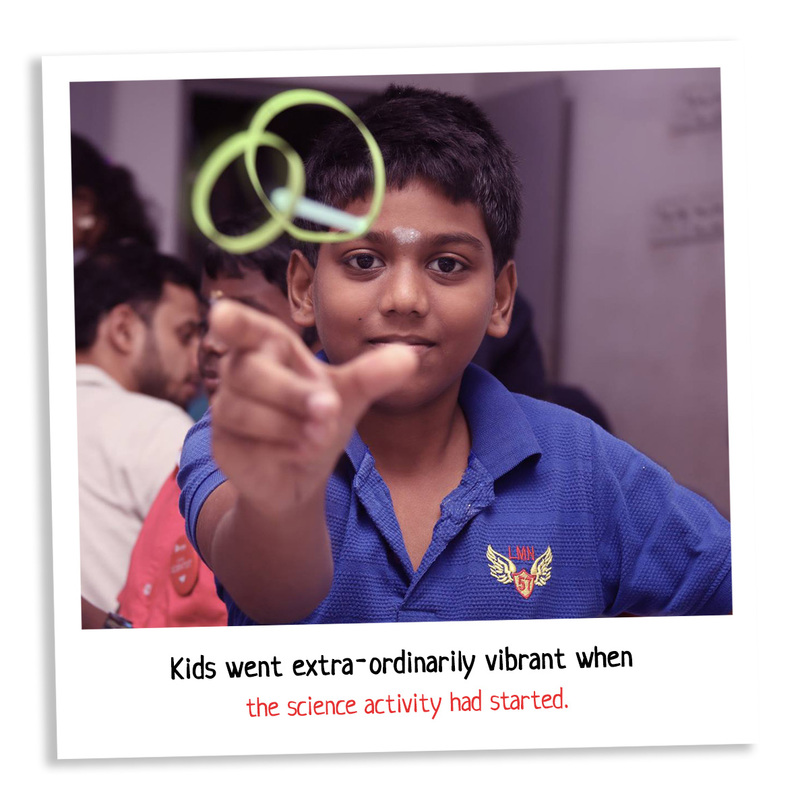 We then gave a give-away science kit to do the workshop from home and children were considering it as a toy to play with later. A science experimental kit took as a toy to play with? What are the odds of that? It takes a lot of effort to demonstrate science topics like a live show in front of spirited children. From the next blog, every workshop will be covered from a perspective of a host from the beginning of their work to the end. We then gave a give-away science kit to do the workshop from home and children were considering it as a toy to play with later. A science experimental kit took as a toy to play with? What are the odds of that? It takes a lot of effort to demonstrate science topics like a live show in front of spirited children. From the next blog, every workshop will be covered from a perspective of a host from the beginning of their work to the end.Then came the Liquid Nitrogen demonstration to make them understand rocket propulsion. We made plastic bottles to shoot 30 – 40 meters high. It literally shoots like a rocket and we could hear voice raising when the bottle leaves the ground. This was the best part of the day. We then gave a give-away science kit to do the workshop from home and children were considering it as a toy to play with later. A science experimental kit took as a toy to play with? What are the odds of that? It takes a lot of effort to demonstrate science topics like a live show in front of spirited children. From the next blog, every workshop will be covered from a perspective of a host from the beginning of their work to the end. © 2017 Copyrights LMES Academy. All Rights Reserved.